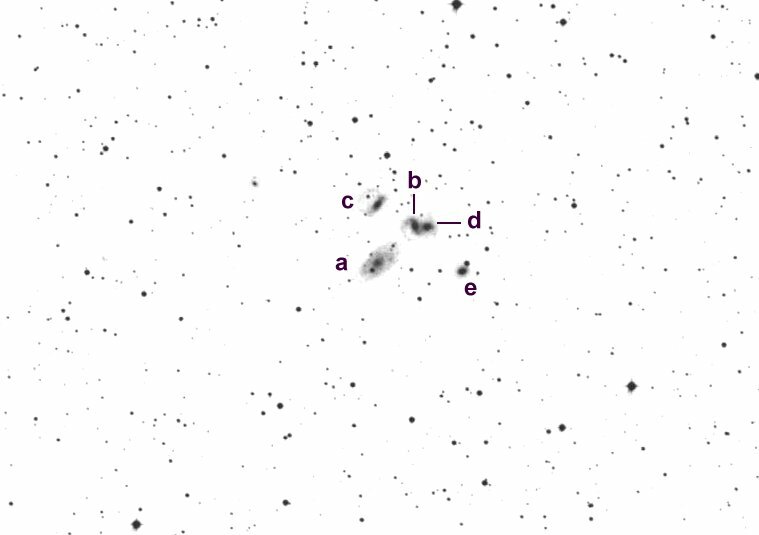 My first view of Stephan's Quintet (Hickson 92 in Pegasus) was nearly 20 years ago in an 8-inch Schmidt-Cassegrain but I still remember the thrill of detecting a feeble glow. Over the years, I've returned this compact group numerous times with larger apertures attempting to squeeze out additional structural details. The entire group is crammed into a 4' circle, so high power is necessary to resolve the individual components. The largest member, NGC 7320, appears 1.5'x0.7' with a gradually brighter core. At the southeast side a mag 14.5 star is superimposed. NGC 7318 is actually an interacting 13th magnitude double system and two stellar nuclei are resolved visually within a common elongated halo oriented roughly east-west.